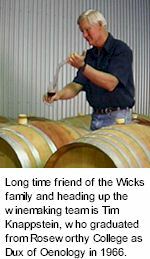 Wicks Estate take Sauvignon Blanc very previously. Heading up the winemaking team is long time family friend Tim Knappstein. After many years experience with Sauvignon Blanc, Knappstein made a move to the Adelaide Hills where he played a major role in pioneering it as a premiere cool climate region. Knappstein's efforts are set to further Wicks Estate's reputation as one of the icon producers of Sauvignon Blanc in the Adelaide Hills. A charmingly perfumed effort maintaining the punch and lifted varietal character of the finest Sauvignon Blanc. Light citrus straw in colour. An enticing bouquet of lemongrass and tropical fruits backed by greener vegetable elements. A fine textural mouthfeel with crisp minerality, pure and refreshing. Aromas of tropical fruits and attractive varietal flavours are balanced by an elegant, lively palate finishing clean and crisp. Match with fresh king george whiting.